Repairing or replacing your water heater should always be left to professionals! Call (206) 654-4990 and hire the best! There are few luxuries in life that are more important than having hot water immediately available. Whether it's washing dishes, cleaning clothes, or taking a nice hot bath, we have come to count on having hot water instantly available whenever we want it. When the water fails to deliver, however, we soon realize the important role that hot water has in our lives. That is when Fox Plumbing & Heating can help! 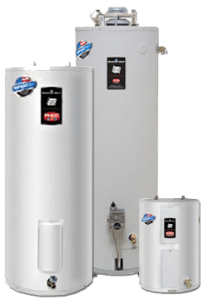 We offer the very best water heater repair and installation services, which can be used to restore this comfort to your home in no time! See what some of our past customers have to say here, and call us to schedule an appointment for your home today. Serving King County including Seattle, Kent, Renton, Sammamish, Bellevue an beyond. Not Enough Hot Water - This is often the first thing homeowners notice. They find that they start running out of hot water before finishing showers or baths. Inconsistent Temperature - Temperature fluctuations are not normal. This makes it difficult to take showers or perform a variety of tasks because the water temperature must be constantly adjusted. Slow Recovery of Hot Water - Many times this symptom is not noticed at first. Residents finish their tasks and don't need hot water for a period of time. Slow recovery, however, is an indication that problems exist. Poor Water Quality - Sometimes the water that exits a water heater can be discolored or have unusual odors. Any discoloration or odor is an indication that something is wrong. Serious Leaks - While a leaky joint or valve may sometimes be repaired, a leaky tank cannot be repaired. Leaks in a water heater generally mean that replacement is necessary. Constant Repairs - If your water heater is constantly in need of repairs or service, it probably needs to be replaced. A new water heater can provide the trouble–free, and worry–free, service that you want. Age - The typical water heater has a warranty range of five to ten years. 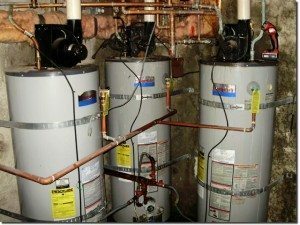 If your water heater is twelve to fifteen years old, or older, and has started showing the above symptoms, it has probably reached the end of its useful life. Regular professional inspection and maintenance can extend the trouble–free lifespan of your water heater. Spotting problems before they become serious will save money and avoid the inconvenience of losing hot water when you need it most. In the event that you do need services, our expert plumbers are here to help. Three power vent hot water tanks, To be replaced. At Fox Plumbing & Heating, we treat our customers like family. We understand how irritating a damaged water heater can be, which is why we offer emergency services to help combat these issues. We will arrive at your home in a timely fashion and provide you with results. Whether you need repairs or replacements, you can rely on our plumbers for the very best Seattle water heater services. We will even work within your budget to provide you with a service that is affordable and long lasting. Additionally, you can schedule an inspection for your water heater to determine the best course of action for your needs today. Also, we offer the best, top of line tankless water heaters as well, click here to learn more about our tankless water heaters. Do you need to repair or replace the water heater in your home? Call us at (206) 767-3311 and get industry leading Seattle water heater services in no time!